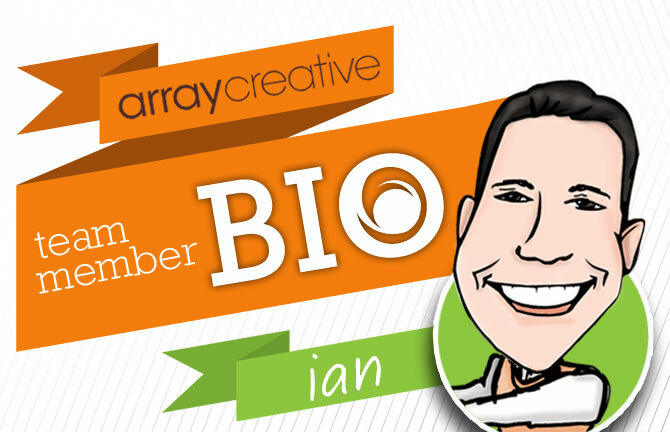 A Belizean native, Ian is a founding partner at Array Creative currently approaching 15 years of design experience. He attributes his love of design to the drafting table his parents gave him as a young boy as well as to the dedicated instructors at his Alma Mater – Florida Atlantic University. Ian has had the privilege of working with clients such as Goodyear, Morton Salt, Hitachi, HoMedics, Valspar, the Discovery Channel and Rubbermaid just to name a few. When not at the office, Ian keeps himself plenty busy with his brood of six at home. Grandma’s cooking, it reminds me of a simpler time. Pandora makes this question difficult. I hate this question: 4 plus 1. Yes. Trying to recreate those simpler times for my kids. Back to the Future and any Rocky. Whatever I can learn from.